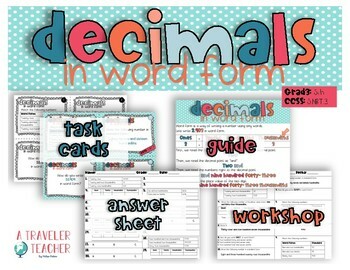 In this resource you will find 20 task cards for the students to write decimal numbers in standard and word form. - Explanation of the topic!!! 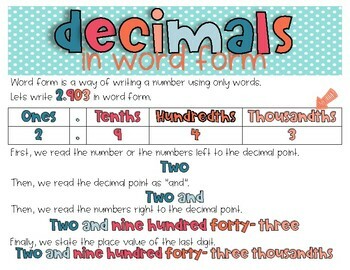 A guide that you can use to explain to the students step by step how to write a number in word form. * The exercises are the same, they are in three different formats so the teacher can choose which one is better for his/her students. This resource is design for 5th grade students. You can also use it with advanced 4th grade students or to make a review with 6th graders. This resource is also available in Spanish!!! Copyright © 2019 Melisa Patiño – A Traveler Teacher. All rights reserved. This product is to be used by the original downloader only. The reproduction for more than one teacher, classroom, department, school, or school system is prohibited without permission from the author. Clipart and elements found in this PDF are copyrighted and cannot be extracted and used outside of this file without permission or license.